The Camel Rock is an enormous rock weighing more than 500 tons. A rock weighing more than 500 tons is hard to find. Even if you found one, you could not possibly transport it using the equipment available today. Additionally, besides weighing more than 500 tons, the Camel Rock is a rock that looks like a camel. So it is a rare kind of rock that you cannot buy even with all the money in the world. 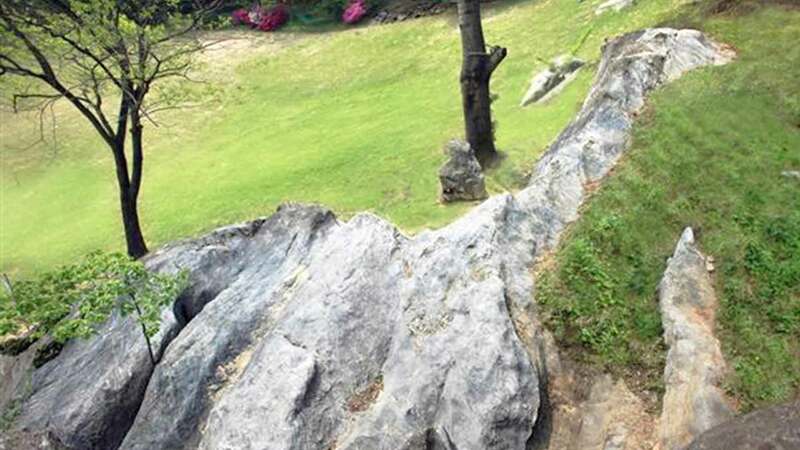 Pastor Jung Myung Seok did not find this Camel Rock fully from the beginning. At first, it was sticking out of the ground only slightly as much as a small pillow. The owner of the field tried to break it by hitting it with a big hammer because the rock was in his way whenever he plowed. His younger brother helped as well. Pastor Jung saw their hammers, which were as big as a man’s thigh. They could bring hammers that big because their family ran a smithy. When he saw what they were doing while passing by, Pastor Jung ran to them and spoke to them. “It’s not a bad thing to break a rock that is sticking out a bit, but that is not a rock that can be removed by breaking. Doing that will only waste the time you could use to plow the field.” He said that while trying to stop and persuade the owner so that he would not break the rock. Because he tried to stop them, they were only able to hit it a dozen of times or so with their iron hammers before having to stop. Because God and the Holy Son knew the future, they made Pastor Jung pass by there at the time when the owner of the field was trying to break the Camel Rock and made him stop the owner so that he would not be able to break it. After that area of land became part of Wolmyeongdong Church, God made Pastor Jung dig out the dirt around the Camel Rock little by little. That rock ultimately revealed its true shape and became known as the Camel Rock. Even for a rock that was treated worthlessly, when the time came and it met an owner that would value it, it became a golden rock. The Camel Rock now shines its light while testifying about God’s present workings.